Summer is a fantastic season for toddlers. As the colder, rainy days finally draw to a close, the arrival of the hot, sunny days allows our little ones to get out into the sunshine and enjoy doing what toddlers do best – exploring the great outdoors. However, before you let your toddler’s inner adventurer come out this summer, there’s a few safety tips you’ll want to keep in mind. The changing temperatures alone can be a big adjustment for your child. 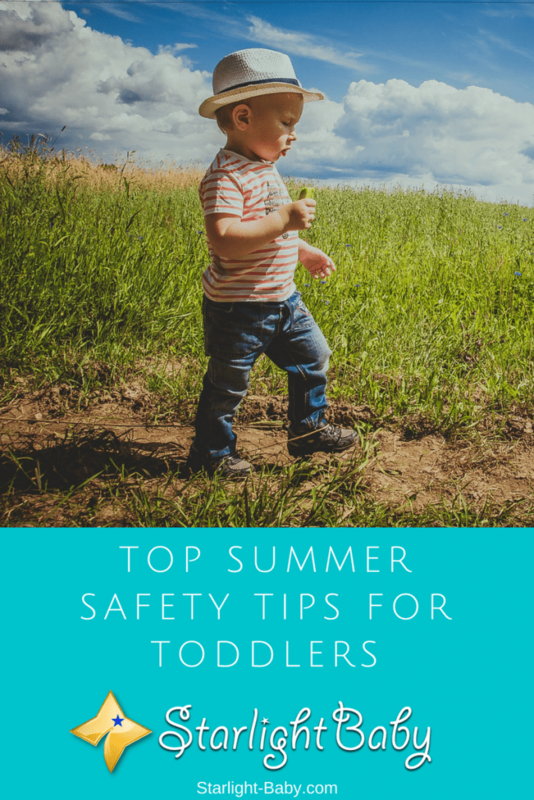 So, if you’re looking to ensure they are safe, cool and comfortable on the upcoming hot and sunny days, below you’ll discover the top toddler summer safety tips to follow. Let’s look at that first piece of advice – limiting your toddler’s exposure to the sun during peak times. This sounds simple enough until you realize that peak times are classed as 10am until 4pm. That’s practically the entire day! The key word to focus on here is “limit”. You don’t need to keep your toddler out of the sun until peak times are over. You just need to ensure they are adequately protected whilst they are in the sun and that their outdoor play sessions are kept short and sweet. Ensuring they are adequately dressed will help with this. Try and find toddler sunglasses which protect your little one against both UVB and UVA rays. Ideally, you’ll also want ones that advertise 100% protection, though these can be difficult to find. A wide brim hat, or a hat with a long bill at the front will also protect your toddler’s scalp. When it comes to sunscreen, make sure you’re choosing one that is toddler-friendly, at least SPF 15, and be sure to apply it even on cloudy days. It’s also important to reapply it approximately every 2 hours, and directly after swimming/water exposure. It’s also good to remember that around sand and water, UV rays tend to reflect off them, posing a higher risk of sunburn. So, if your little one is playing in a sand pit, or near water, you’ll want to top their sunscreen up a little more frequently. Heat stress is something many parents have never even heard of, but it’s a very real threat to your toddler. At the moment, your little one isn’t capable of regulating their own temperature. This means, if they are exposed to extreme temperatures, it could prove fatal pretty quickly. Clothing – Ensuring your toddler is wearing light clothing, both in weight and color, is important. Darker colors absorb the suns heat, causing the body to heat up much quicker than it would in light colored clothing. Gradually Build Up Your Toddler’s Heat Exposure – You’ll also want to keep an eye on how active your little one is in the sun. Aim to build up their heat intensity gradually. So, when summer first arrives for example, allow them to play out in the sun for around 15-20 minute intervals. Each day, or every few days, you can build up to allowing them to spend longer out in the heat. This will essentially help to acclimatize their bodies, reducing the risk of heat stroke. Ensure They Are Hydrated – Heat stress becomes a real problem when the body is dehydrated. Before your toddler heads out to play, ensure they’ve had either water, or juice. If they’re really active in the hot summer heat, make sure they have a drink break approximately every 20 minutes. These are the main tips to follow in order to help protect your toddler against heat stress. It’s best to use your own judgement too when it comes to how frequently to give your little one a drink. They may need one sooner than 20 minutes, so take into account the activity they’re doing and how hot it is and of course, ask them frequently if they’re thirsty. Summer doesn’t just bring danger in the form of the heat and UV rays. Insects can also pose a real problem. After your little one has been outdoors, be sure to check their body for ticks. You may want to invest in a bug repellent, but if you do ensure it is safe to use on toddlers. Generally speaking, bug repellent which contains DEET is considered the most effective, but it should be concentrated below 30%. It’s a good idea to check with your doctor before using any bug repellent on your toddler, just to be on the safe side. It’s also worth pointing out that natural based bug repellents aren’t always safe for toddlers. These include products which use citronella or lemon eucalyptus. So, what if you do find a tick on your toddler’s body? The best thing to do is to use tweezers to pull the tick out by its head. If you try to tweezer the body, the head could fall off and become embedded in your little one’s skin. Germs are only usually transferred to the body if the tick has been embedded for around 24 hours. You’ll need to contact your doctor or pediatrician if you think your toddler had the tick for this amount of time. Overall, summer should be a season full of fun, laughter and outdoor exploration for your toddler. However, you do need to pay attention to the tips above to ensure they enjoy the hot summer days safely. Do you have any tips of your own? Do us all a favor and share yours below – it’d really help us all out! Perfect timing! It’s getting hotter by the day and we’ve already reached 30°C here. We were driving home in the car around 11 AM and I saw a mother taking out her toddler in the blazing sun, without any shades or a hat. It made me wonder why? Why would you take your child out in such high temperature unless it’s really necessary? but even then please moms, make your child wear a hat/sunglasses. I always keep my boy inside when the sun reaches maximum temperature. We try to go outside in the early morning or late evening. Of course, sunscreen is a must in these situations. You really don’t want your child to get burnt – their skin is so, so sensitive. Be extra careful in these hot days that are coming. This is a well written article. The tips is very informative and professional. I would add or you can do a follow-up article by giving safety advice for toddlers, especially in the area of containers being left about the beach or park that the child could pick up and placed in their mouth, etc…. When you start to feel the heat of the sun under a spacious and airy shade you know summer is on it’s way. Getting yourself and family ready for the upcoming heat is an important task at hand especially if you have a toddler. This article stressed on the main points parents need to focus on in protecting their loved one. I personally don’t allow any play time outside from 11 a.m to 1 p.m due to the sun being at it’s highest point in the day. I would also advise to parents to get hats that are breathable so that the child’s head don’t overheat. (Fun fact-Your head helps body heat to escape.) A next useful thing that you can do is apply insect replant to the clothes that the child is wearing. All in all this article was put together beautifully and I hope that my added tips will help someone. Great tips! I usually put a baseball cap on my toddler. It gives more protection than you’d think. Sunscreen is a must and I also carry around a spray bottle so I can keep my toddler cool when I need to. Another must-have is a small hand-towel. You’ll want to have these to wipe your toddler’s sweat. My toddler gets rashes if I let the sweat soak for too long so I always try to keep her dry. You can get a nice towel for less than $2 and they really come in handy. They’re much better than regular tissues which is what I used before I had a towel. I try to take my toddler inside every two hours or so. Even with all the protection, I think it’s better to take a break from the sun after a few hours. So pull your toddler back inside for a snack and maybe a nap. You can let them out again after a little break, but I personally won’t leave my toddler outside for more than 2 hours straight. I’ve never heard of the spray bottle to help keep your child cool but I can see why you do it, it’s a great idea. In terms of wiping off your child with a towel and spraying her do you do it separately where you’ll call the child over from playing to wipe her down then later call her over to spray or do you do it all together (spraying then wiping the child one time when you call her over)? If you do it together when you spray the child how long do you allow the water to help her cool off before wiping it? This article is very well written. I am really careful with my toddler because he likes to put in his mouth different plastic toys but this article helped me even more. I never thought of heat stress until now. Nowdays i mostly never go to a doctor because articles like this that are really helpful. Please don’t ever avoid a doctor visit because of something you read online. It’s always better to be safe than sorry and it’s impossible to diagnose everything accurately. Nothing on our site should be considered as medical advice. Great Article! I am a first time mother and I wonder about the sun and how it effects my son with his day to day outdoor activities. Thanks for the information! Thank you for sharing these good tips. As we are staying in tropical country, these apply to us all year long. We always have to make sure the toddlers or young kids drink enough water. Insects, especially mosquitoes are around all year long, and I just started to learn how to make natural mosquito repellent with essential oil as it might be safer for kids. Every one of these tips is so very important! We started using a very high spf when my daughter got older an was outside more, and it was a good decision for us… we’ve never had a problem with it since using it… no sunburn issues at all. And the ticks, absolutely… they’ve gotten so bad over the last few years and it seems as if there’s always a new (and often worse than the last!) disease that is spread by ticks, so it’s very important to keep a watch out for those when outside whether or not the child was in tall grass, I think. I can’t really think of a tip that you haven’t covered here. My daughter usually has electrolyte water with her when she’s going to be in the sun for long periods of time. I would call your blog a perfect kit for kids in summer. There is only one thing I would add and that is may be kids need supervision if they are in strange territory such as public parks. Whatever the climate kidnapping is on the increase and that should be kept in mind while they romp around. Also a first aid kit could be a part of this kit. Summer is gone, fall is here. Our baby was born this summer. In the next summer, he will be a toddler. he will begin to walk, he will begin to speak. When our baby starts walking we will have to watch his steps, we will also have to make sure that is wearing proper clothes and shoes. When the baby beings to walk, he might walk everywhere, and you have to take a lot of care when he walks outdoor. You may apply sunscreen, however, you must be sure whether the sunscreen you are using is child safe. In the summer, the child also likes to have fun with water. You should be careful when thre baby is in his bath tub or pool. Toddler’s needs intensive care and attention from their parents and there are some seasons of the year that needs extra work from the parents to take good care of the kids. Most of the things discussed here are very helpful especially protecting them against insects because they seat on the floor where insects can easily crawl up.